Bathroom faucets come in a variety of colors, styles and sizes. The one you choose will depend on the look you want to create. Is your home Western, traditional country or modern? Faucets come with two handles or are single-handled. Some are mounted to the wall and others on the sink. One style centers the handle right above the water spout. Bathroom faucets cost anywhere from $35 to $200, depending on the metal and finish of the faucet. The drinking faucet was invented by a plumber named Luther Haws in 1906. Because his father had died drinking contaminated water, Haws set out to discover a sanitary drinking system. The single-lever faucet came next, invented by Alex Manoogian. There were two styles--a full ball-valve faucet with the handle on the side, and a compression faucet with the handle attached to the top of the faucet. Bathroom fixture companies are re-creating these old-time faucet versions to add antique charm to contemporary bathrooms. 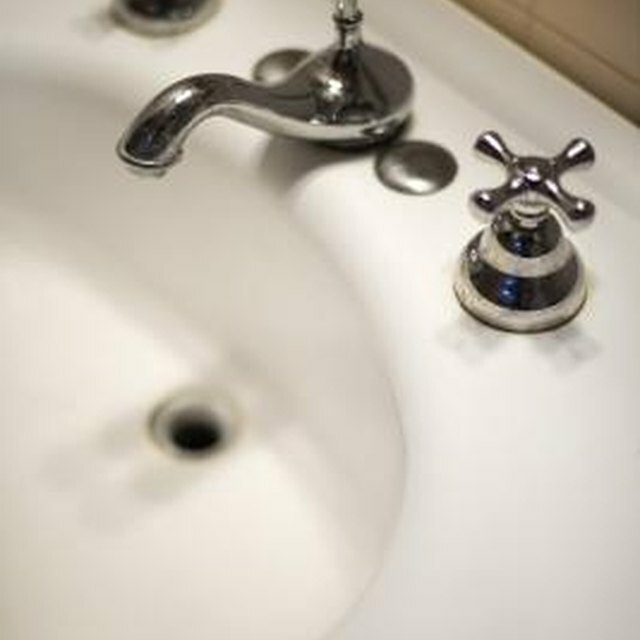 The function of a bathroom faucet is to provide water from a fresh source. Bathroom faucets come in four groups, depending on their working mechanisms--the parts of the faucet that control the water flow. The compression faucet has a separate hot-and-cold delivery system. It uses washers and seals that shut off the water delivery when the valve is closed. These faucets tend to leak over time as the washers and seals wear out. Cartridge, ball, and disc faucets all have mixed hot-and-cold water valves. They do not use washers or seals, but o-rings and neoprene seals to prevent leaking. These are preferred. Generally the best choice is a faucet that has solid brass or corrosion-resistant mechanisms. Don't choose a small chrome faucet to sit above a porcelain pedestal sink--just as you wouldn't install a gold faucet with crystal handles if the bathroom contains a small stainless-steel toilet. When choosing your bathroom faucet, pay attention to size as well as theme. Bathroom faucets come in these styles: chrome, brass, enamel-coated, ceramic, antique, pewter, bronze, gold, platinum and nickel. Level handles are the best choice for an easy grip. Cross handles are elegant, and motion-activated faucets have no handles at all. Bathroom faucets come with a variety of drillings that work with certain kinds of sink basins. [A widespread faucet](https://homesteadycom/info-8448648-widespread-faucethtml) set works well with a three-hole, pre-drilled basin. This faucet system has a separate spout in the center with a handle on each side, all installed separately. Center-set faucets are a mini-widespread type. Instead of providing three separate holes, this system comes with a spout and a handle set on one base unit. The unit is then plumbed into the sink basin. Single-hole faucets are an all-in-one system. The spout and the one handle comes in one unit and is plumbed through one drilled basin hole. A wall-mounted faucet has a long spout that extends down into a separate sink basin, usually pedestal style. The wall-mounted faucets require a separate valve and drain. Points to consider when choosing the best bathroom faucet include the valve construction and benefits of certain finishes. Compression valves contain washers that can wear out over time. They may drip, but the washers are cheap and easy to replace. Ball valves are durable and reliable. They use a slotted metal ball to control water flow, but they can only be used with a single-handle faucet. The cartridge valve is also durable and reliable. They are easy to repair and can be used with both single- and double-handled faucets. Ceramic valves are more expensive but are maintenance-free. They can be used with both single- and double-handled faucets and have extended warranties. When purchasing a certain faucet finish, consider that brass may scratch, tarnish or corrode. Chrome shows water spots. Enamel coated can chip and fade, and gold, PVC, stainless steel and nickel are more expensive. What Color Faucet Do I Use With a White Kitchen Sink? How Do You Put a Kitchen Sink Water Faucet Back Together?